I decided to change up some of the lighting in our house to achieve a more rustic farmhouse look. This is the chandelier that used to be in our bedroom. Sorry, not the best photo. So here is a picture from the website that sells them. 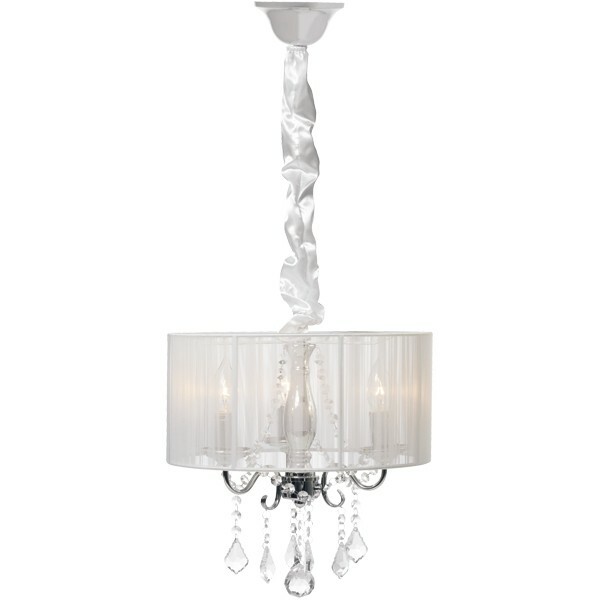 The main part of the chandelier was chrome, with hanging crystals, covered with a string white shade. The string cast strange shadows in the room, but it was the satin fabric covering the chain that really annoyed me. I cut off all the string on the shade to reveal the fame. Then I used black chalk paint to paint all the chrome parts and the shade frame. I wrapped the chain with jute rope. And replaced out the old globes with new frosted candle globes. I took off some of the crystals so that they didn't hang as low. I wanted to keep some crystals as you need a bit of bling in the bedroom. The only cost was the jute rope for approx $5, and I practically have a new chandelier.